Transformational Innovation: creating principally new products and business models to serve markets and customer needs that may not yet exist. The major benefit of the 3-horizon innovation framework is that it shows to organizations how to structure, govern and, most importantly, fund innovation programs while successfully managing risks. Unfortunately, as formulated, it is silent with respect to specific innovation tools that organizations should use when approaching different innovation horizon. Earlier, I proposed a “map” of open innovation tools and attempted to match some of these tools (here and here) to specific stages of business model innovation. In this piece, I want to discuss how three different open innovation tools—customer co-creation, engaging startups and external crowdsourcing—could be applied to the three innovation horizons. I believe that customer co-creation is the most efficient when applied to the Core Innovation, when organizations deal with incremental improvements of their existing products and slight tweaks of their business models. This stems from the two-way interaction nature of customer co-creation that provides opportunities for early customer feedback, which allow organizations to rapidly test hypotheses and Minimally Viable Products (MVPs). The ability of providing immediate feedback to MVPs expands the usability of customer co-creation into Adjacent Innovation. However, its efficiency here appears to be lower than in the Core Innovation horizon, because customers may have trouble to articulate their unmet needs when it comes to new products. It is for this particular reason—the inability to express the needs for something (be it a product or a service) that doesn’t yet exist–that customer co-creation becomes virtually useless in the case of Transformational Innovation. This pattern gets reversed for engaging startups: this approach is useless when applied to Core Innovation, gains some strength in the Adjacent Innovation horizon and is at its best when used for Transformational Innovation. By their very nature, startups—at least the best of them–are entities created for the purpose of transformational change of the existing technology and/or business landscape. By engaging startups, organizations would “hire” players with the creativity, flexibility and audacity to challenge status quo that can rarely be found within internal R&D teams in most mature organizations. I’m not saying that engaging startups is making Transformation Innovation easy. What I’m saying is that by creating a vibrant startup ecosystem, organizations can make this type of innovation possible and, perhaps, even sustainable. I’d even go as far as to claim that for the vast majority of large and mature organizations, engaging startups is the only Transformational Innovation tool they can use with repeated success. 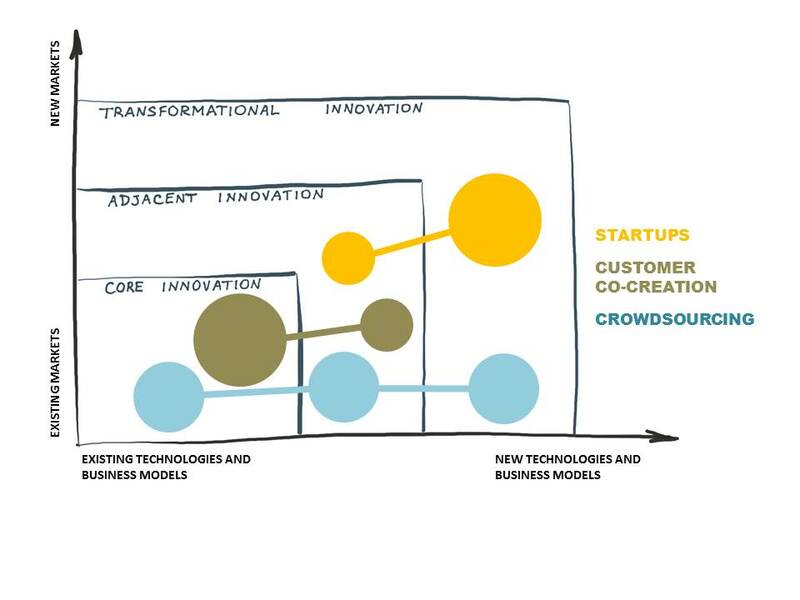 Crowdsourcing stands out among other open innovation tools in the sense that it can be used, equally successfully, in all three innovation horizons. The reason for this “omnivorousness” lies in the very nature of crowdsourcing as an innovation tool. Crowdsourcing is essentially a question that one asks a crowd of people; the nature of the answer one receives from the crowd is determined, first and foremost, by the nature of the question. By properly formulating questions addressing problems and issues of increasing difficulty, complexity, time horizon, risk and ambitions—and helping crowds to come up with plausible answers to these questions–organizations can successfully apply crowdsourcing to all innovation horizons. Now, again, I’m not saying that crowdsourcing is easy; before, I pointed out at its limitations at some stages of business model innovation. My point here is that the onus of properly formulating a question is on organizations—and this is something that can be learned—whereas crowds, as they have shown time and again, can come up with an answer to pretty much any question, regardless of its scope and nature. This entry was posted in Innovation and tagged Adjacent Innovation, Crowdsourcing, Customer co-creation, Incremental Innovation, Innovation, innovation ecosystems, Innovation Management, innovation tools, model of integrative innovation management, Open Innovation, Open Innovation Tools, Radical Innovation, Ralph-Christian Ohr, Startups, Transformational Innovation. Bookmark the permalink.